Congratulations on your engagement, Mikki! Tell us about the proposal. Brian totally surprised me and knocked it out of the park! I thought it was supposed to be what my best friend Alex and I call "best friend day,” so we took Parker’s class and went back to my apartment to get ready to go to dinner. Alex was really dressed up, so I was like, oh I guess I'll look cute too. 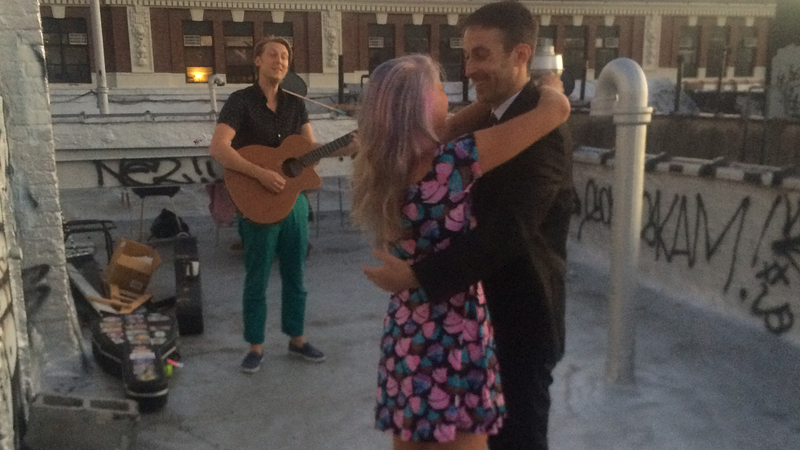 And I got a text from my now-fiancé Brian that said to come to the roof and see the sunset, which is something we normally do. I walked up to the roof and at the top of the stairs were about 50 candles. 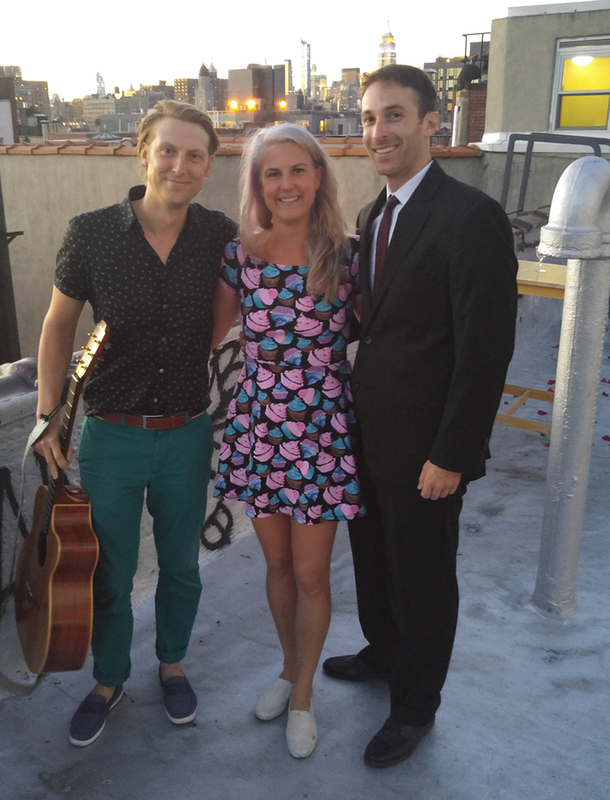 Then I walked out on the roof and there were rose petals on the floor, Brian was dressed in a brand new suit AND he got my FAVORITE musician - Eric Hutchinson - to come and play guitar while he proposed! That sounds beautiful! Let’s back up. How did you two meet? We met at a show we both played. He was in another band playing bass, and I played a solo show after him. He stuck around for my set and then came to another show of mine and brought a bunch of friends, got me a shot of Jameson and the rest is history. On our first official date, we went to see some musical improv at The Magnet Theater. Magnet has this awesome musical mixer, where anyone can come up and make up a song and the host's are hilarious and it's just a good time. So I went up and sang, and then we biked down to the LES and got some drinks. I liked that he was kind of up for anything and loved to laugh. In January it will be three years! Amazing! 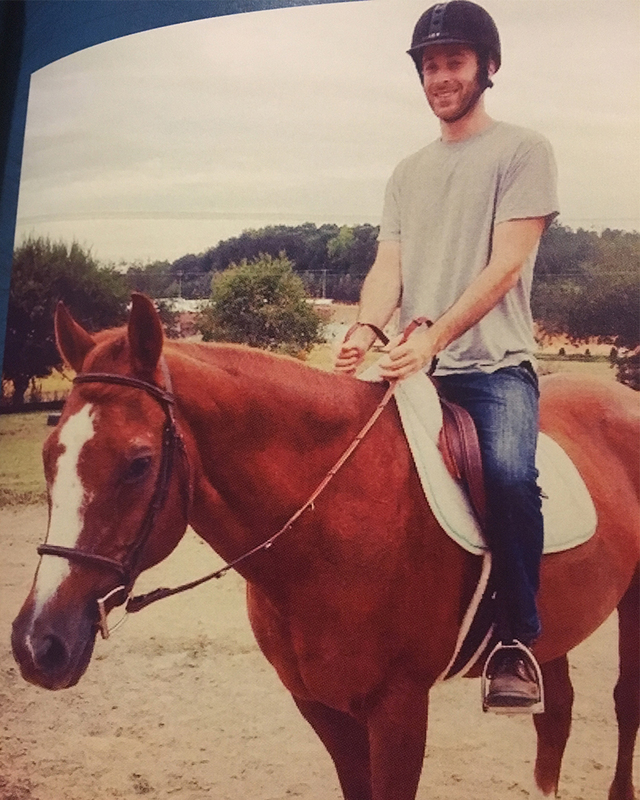 So tell us — does Brian tap it back in your classes, or do you guys ride at SOUL together? He does! I'm always impressed because he gets better every time — and is always rocking the front row! He will also occasionally take Parker’s class with me and has done a couple community rides with me to support my friends and new instructors. What is your favorite memory with both of you? My favorite (other then the proposal!) was when he met my horse for the first time. My horse, Sinful, is my best friend in the entire universe and to see my two loves together was just an amazing feeling. And he did a good job riding too! That’s so fun! What about your favorite SOUL memory together? Oh wow, that's a good one. When I was teaching the rooster classes on the Upper West Side in NYC, he used to wake up early and ride them with me. It was so nice to have that support and more then that it was cool to be able to start the day together. It also seemed like that morning workout was something he looked forward to. We’re mostly just enjoying the moment, but we are thinking summer of 2018 so we can have plenty of time to find the right place and have fun with it. I am looking forward to spending the rest of my life with my prince charming. Oh man, that was cheesy... but it's true... I’m keeping it. I had never been in love before Brian, and he had never been either, so getting the nerve or even knowing that I was in love was kind of scary. But I remember the day I realized that I was in love with Brian — it was the last song in Parker’s class before stretch and he told everyone to tell themselves a secret. I was kinda stumped and didn't know what mine was and then I was like, "Oh my God, I love Brian!" and then sprinted home. So that was a moment I'll never forget.